Mystica Girls is a heavy metal band from Mexico that has been around since 2005. In 2012 I covered the group's second EP, "Metal Rose", and now the only original member left from that line-up is guitarist/vocalist Cinthya Monroy. Back then the group had a lead singer who also played the violin. While that was certainly different, 2016-era Mystica Girls gets my vote for best overall sound and it's not exactly a close race! This 13-track recording, which is less than four months and still finger blistering hot to the touch(! ), is the English version of the group's third full-length album, "Verónica, la cortesana del infierno". In addition to Cinthya Monroy (a skilled guitarist who took hold of the microphone in 2016! 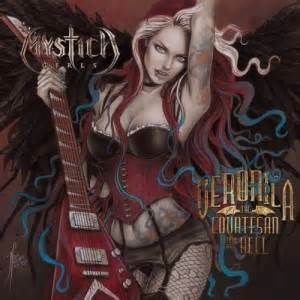 ), "Veronica, the Courtesan from Hell" features the talents of Bianka García (rhythm guitar), Andrea Qatrina (bass), and drummer Yolanda Moreno (Inharmonious). Despite numerous line-up changes over the years and the fact that this Mexican outfit started out in life as a cover band, Mystica Girls's latest release has the vibe of veteran act that has been churning out classics for decades! First off Cinthya Monroy shines in her new role as guitarist and lead vocalist. For a group that has had more than it's fair share of lead singers, Mystica Girls seems as if it has finally won the lottery with this line-up. Monroy's vocal delivery perfectly suites this band's atmospheric style of traditional heavy metal. On "Veronica, the Courtesan from Hell" she guides a one-in-a-million band that enthusiastically mixes goth metal, power metal, vintage heavy metal, dark metal, and occult metal into it's spell* for word wide conquest! With everything that's been happening on this crazy place that we call Earth, I'd gladly follow these metallic ladies and let "Veronica, the Courtesan from Hell" serve as our rallying call! God only knows why I lost track of this band after "Metal Rose". Thank the maker for second chances! *Said spell starts off with a base of (original) hard & heavy traditional metal. It's only after the pot has come to a roaring boil that Mystica Girls adds in the different ingredients. Excelente el disco de Verónica, buen ritmo. Me encanto. The album can be downloaded off of iTunes. That is where I bought my copy.